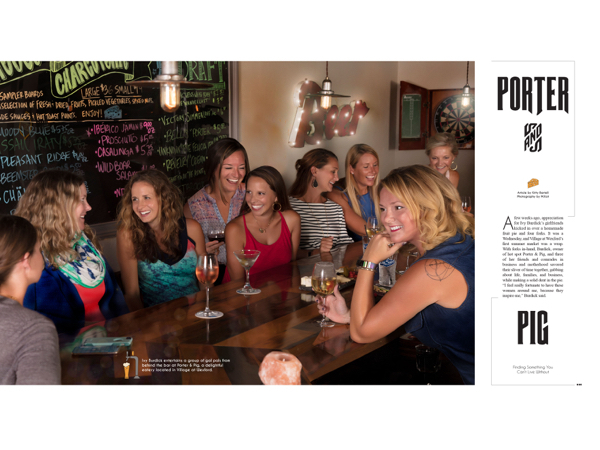 Ivy Burdick entertains a group of gal pals from behind the bar at Porter & Pig, a delightful eatery located in Village at Wexford. A few weeks ago, appreciation for Ivy Burdick’s girlfriends kicked in over a homemade fruit pie and four forks. It was a Wednesday, and Village at Wexford’s first summer market was a wrap. With forks in-hand, Burdick, owner of hot spot Porter & Pig, and three of her friends and comrades in business and motherhood savored their sliver of time together, gabbing about life, families, and business, while making a solid dent in the pie. “I feel really fortunate to have these women around me, because they inspire me,” Burdick said. Aaron Dempsey mixes cocktails with a smile and a story for three ladies chatting at the bar. 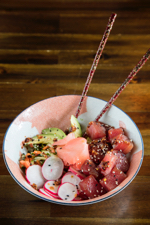 A beautiful sesame tuna salad with avocado, radish and ginger. Setting out to create a pub-like meeting place for her Porter & Pig customers, Burdick took inspiration from her family. “If they were going to have appetizers before dinner, or if we had been gone for a long time and were coming back home—college or what have you—my mom would serve Jarlsberg cheese and summer sausage, and sweet hot mustard with Triscuits, and we would sit around a gab.” A bit higher on the sophistication scale, her charcuterie-inspired menu gives customers the opportunity to nosh on shared plates, an original meat and cheese selection, and sandwiches, while enjoying outstanding beers, craft cocktails, and a thoughtful selection of wine. Burdick sees Porter & Pig as a part of the bigger picture of the burgeoning culinary community on Hilton Head Island. “You find these little pockets of culinarians that are down here, and this isn’t just a beach vacation for them,” Burdick said. “They really want to try to the food, and that’s super fun, because I can say, go see Amanda Russ at Pomodori; she makes her pasta from scratch and it’s all really wonderful. Or go see Clayton at Lucky Rooster, or go see Andrew Carmines down at Hudson’s, because he’s doing phenomenal local seafood. I can set people on these culinary adventures. 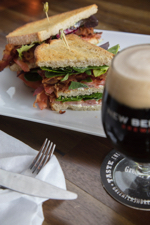 Swing by Porter and Pig for a BLT and a cold brew. 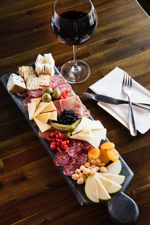 A Charcuterie plate with a bottle of Pinot Noir is the perfect way to kick off an evening with friends. “We do have a lot of really talented and phenomenal chefs and restauranteurs on this island. Giving them the opportunity to have their time to shine, people are going to come back because, not only was this a great family vacation, a great beach vacation, a great golf vacation, now we’re really becoming a food and dining and bar scene destination. This is all starting to come together, which is going to create this amazing package for Hilton Head as a vacation destination. Nurturing and encouraging that is going to go really, far. Accompanying the outstanding bar selections, delish menu options, and nightly dart games, Porter & Pig brings in the kind of live music that further feeds on Burdick’s view of Hilton Head Island as fertile ground for all things creative. “We do live music on Mondays. It’s a classic rock duo—guitar and vocals. We also have live music one weekend night, either Friday or Saturday. We’re this teeny, teeny, teeny, tiny little space, and we have some phenomenal musicians that like to play here. That’s enormous because, for as small as Hilton Head is, the level of musical talent that we have here is absolutely, astronomical. I have been so fortunate because I sit there and watch it first-hand.” Some evenings Burdick may even be found playing a little background cowbell…just for fun. That’s the beauty of role models, and appreciating the people who inspire us. Like Burdick, they are blissfully unaware that they are shooting stars of inspiration themselves. We may need a few more forks. Porter & Pig is located in the Village at Wexford at 1000 William Hilton Parkway, Suite J7C, Hilton Head Island. For more information, please visit porter-pig.com or call (843) 715-3224.